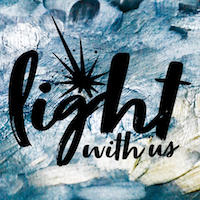 These graphics offer a visually engaging way for you to share the "Light With Us" theme with your community during Christmas. Download includes files for print and web so you can use them for projecting images and slides in worship, printing on bulletins, study materials, church publications, and advertising your worship on your website and online. As a continuation of our 2017 Advent Theme, Let There Be Light, Light With Us recognizes the light that has been and always will be present—the light that cannot be contained. In this design, the light burst from the Let There Be Light logo breaks beyond the hand, showing starburst unbound, shining bright and close, just as Christ comes close and shines among us.